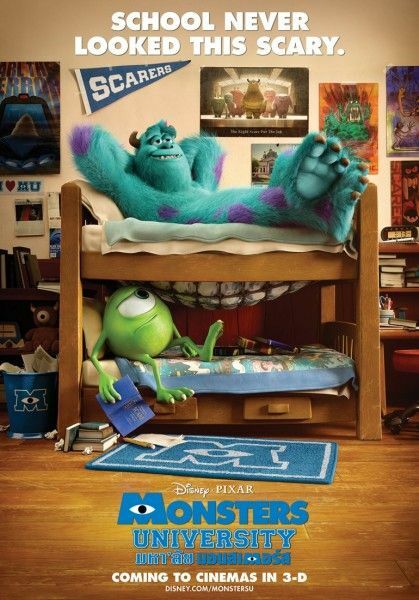 The marketing campaign for Pixar’s 2013 release Monsters University looks to be in high gear, and I’m loving the faux-college virals they’ve been putting out thus far. Today another such video has landed online, as we’re treated to “A Message from the Dean,” which plays like all of those cheesy commercials that colleges put out year after year. It does a great job of capturing the spirit of those spots, and it also gives us a look at some new footage from the film. The monster designs look incredible, and I can’t wait to see the rest of the creatures the folks at Pixar have dreamed up. Also, is that Helen Mirren’s voice as the film’s Dean? The recent featurette for the film hints at a major role for that character, so the casting would make sense. Hit the jump to watch the video, and click here to watch the recent full trailer. The film also features the voices of Billy Crystal, John Goodman, Steve Buscemi, Dave Foley, Julia Sweeney, Joel Murray, and Peter Sohn. Monsters University opens in 3D on June 21st. Courtesy of the film’s official viral site (via First Showing).